Thanks to Tim Dawkings from gigafy for providing the below guide on how to use Google Suite as your SAML Identity Provider. Add an attribute for each of the SAML attributes in the SupportPal documentation that you wish to use. The attributes can have friendly names here, and do not need to match the system name. Update your individual user accounts, populating the new attribute fields as appropriate. Custom attributes can also be added easily using Google's APIs instead of the Admin Console. Create the file /config/production/saml.php in your SupportPal installation, according to the documentation. For the entityID value, use the Entity ID provided earlier by Google. Because Google Suite do not support the singleLogoutService mechanism, for the singleLogoutService url value, you can use https://accounts.google.com/logout, which will ignore any posted data and logout the entire Google account when the user chooses to logout of SupportPal. For the x509cert, paste the certificate that you downloaded earlier from Google. 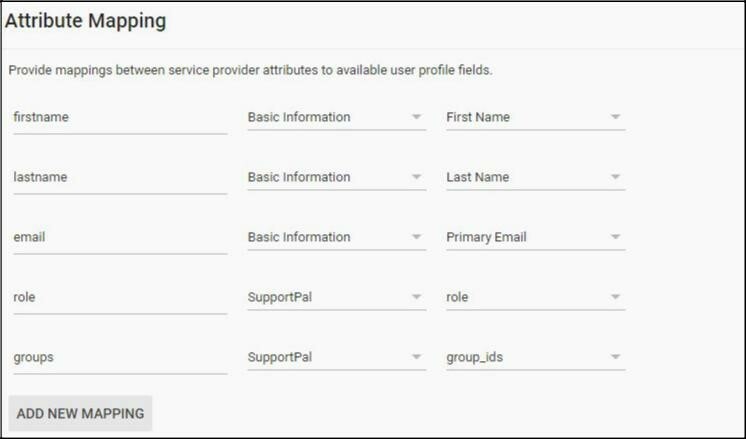 If you have more than one brand in SupportPal, and users access the helpdesk using different URLs, you will have to create a SAML App in the Google Admin console for each brand individually.